I love the lights and the music, and children dressed in bathrobes and angel wings for their Christmas pageants. In our new neighborhood, just around the corner, busloads of people come to look at an entire street decked with lights and decorations. The backyard of one house is set up to resemble a walk through Bethlehem on the night Jesus was born. December has been a time of joyous anticipation, but the reality for many of us, is that it has also been a season of navigating hard places. The eternal and true God really became flesh and blood, not for only for our celebrations, but also for our heartaches. I want to carefully enter the upcoming weekend , aware and sensitive to the tender path some of the people I love are walking. My beautiful sister-in-law, Lisa, is celebrating Christmas for the first time without her dad. As much as she loves the manger, the life of the baby in the manger is what gives her hope. My sister’s dear friend Jodi, who unexpectedly lost her husband just weeks ago, is holding on to hope and taking her next breath, because the grown-up resurrected babe is the one who is her peace. For both of them, the manger is what makes heaven the reality they cling to. Within the past 24 hours I have joined an online prayer group, lifting up a little girl in Texas who unexpectedly fell ill just days ago. Her name is Kennedy Grace and I know her mom and dad would love to have you join in prayer for her continued healing. Jesus came to the manger for days and moments like this. He is the baby we celebrate, and the healer and redeemer of all that is broken. The front of TIME magazine on my desk holds the cover picture of a darling Syrian baby, born in a refugee camp in Greece on September 30th. Jesus came for baby Hamida. This story we remember is so much more than a journey to Bethlehem. 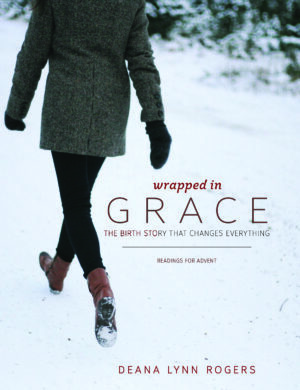 It is the story of the baby, for sure, but it is ultimately the story of a Savior. 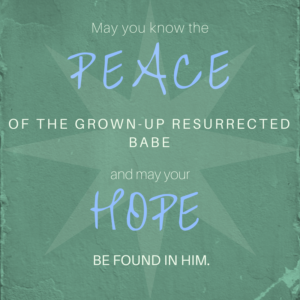 If for you, the next few days are coupled with hurt or loss or struggle; when in the midst of your celebrations, you are reminded of the brokenness of our world — may you know the peace of the grown-up resurrected babe, and may your hope be rooted in Him. Blessings to you all this Christmas!